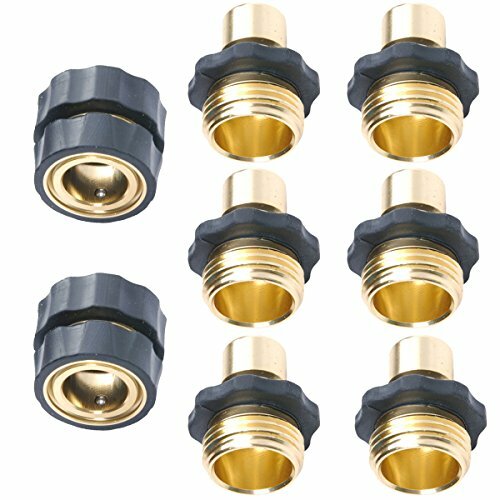 It's perfect for garden hoses and power pressure washer, RVs, boat or anywhere there's a standard 3/4"
- Value Pack, Includes 2 female and 6 male Hose Fittings. - Solid metal construction,high quality aluminum alloy. PLG Brand,Made from high quality aluminum, Meet EU Aluminum Quality Standards,Very LOW Lead Content(Ava<0.1791%).Without flow stopper,KEEP water flowing. NOTICE:Used for garden watering tools only,Used with a pressure under 60 psi. Set includes (2) Female and (6) Male Connectors to conveniently swap up to different attachments.Made from high quality aluminum. Excellent value and quality, It's perfect for garden hoses and power pressure washer, RVs, boat or anywhere there's a standard 3/4" garden water hose hookup,work with your camper, sprayers,nozzle, tree soaker etc. If you have any questions about this product by PLG, contact us by completing and submitting the form below. If you are looking for a specif part number, please include it with your message.